During my time here I have presented many shows ranging from "Sunday Best", "Saturday Lunch", "Thursday Nights Frollocks" and "Fun on Friday's”. At present I am the current "Saturday Sports” presenter, which isn't a easy feat as I know nothing about sports and can always bluff or ad lib my way out of a bad situation!! 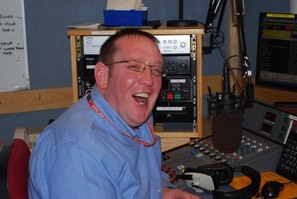 During my in house radio career, I have received three nationally acclaimed Hospital Radio awards, which I am still very proud of as they are always on show in the smallest room of my caravan!! As the current chairman of the service I enjoy the "giving back to society" feeling,whilst being an active member of this wonderful voluntary service, I will always enjoy the task of bringing out the best in my volunteering colleagues and of making the patients of the Maidstone hospital life's more bearable whilst they are here.